1. The Sticky Factor: An effective statement creates a personal connection to the artwork and stimulates our human thirst for “story.” This, in turn, triggers… longer memory storage, and increases the sticky factor about your art, by immersing the viewer in two languages: visual and linguistic. 2. 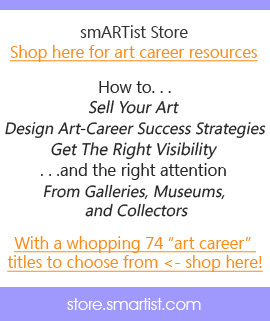 Not Just For Your Audience: Another secret is that the artist statement is not just for art patrons and gallery owners. It is also for you, the artist. The very effort of searching for words, which reflects your relationship to your art, increases your creative flow. This is true whenever we engage in a form of self-expression that pushes us out of our comfort zone. Like sweat from physical exertion, the struggle gets your juices flowing. 3. Defining An Artist Statement: Definition tells you if you’re headed in the right direction. It also saves a lot of angst and prevents you from unsightly fingernails. Here’s my definition: an artist statement is a personal reflection on what, how, and why you do what you do, from your perspective. 4. It’s About You: An artist statement is personal, as personal as your art. Your audience thinks you are magic and if they stand close enough, some of it will rub off. Let them stand close enough. 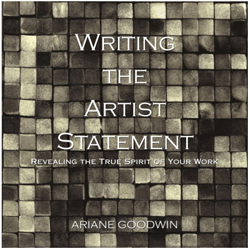 Have you written your artist statement? Or polished up an old one? Tell me, what was the hardest part? 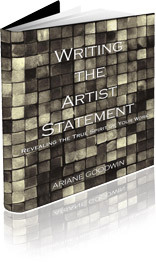 Hello Ariane, I enjoyed your commentary about artists’ statements, how true how true. Your tips are very useful and I hope help some artists to review or rewrite their statement. I found it interesting though, that many artists actually don’t want to write one. They say; they don’t need a statement, because their art speaks for itself! They refuse to understand that the statement makes their art more accessible and understandable to a wider audience. I personally think it is very important. Aren’t we trying to communicate an idea or a thought with our art? If we can’t clearly explain the; What, How and Why, how would the viewers? Yes, Vered, I’m with you! In my book (Writing the Artist Statement: Revealing the True Spirit of Your Work) I talk about the real fear behind artists’ response that their work shouldn’t need works because it’s visually self-explanatory. I think maybe the folks who are so resistant to writing an artist statement may be the ones who find the act of writing to be a chore. So, Ariane, that makes what you do even more important! Definitely, Bonnie, I think in many cases that is part of the problem. I also talk about this in my book, and how our educational system backs us away from what I call our natural, authentic language. But writing the statement is about their art and they can write it as a draft and have it proof read and corrected by one that can write. Just as long as they write it!!!!! Good point,Vered! And so obvious that it clues us into the real issue, which at the root is a fear. But fear is actually a continuum that ranges from hesitancy all the way to life threatening. The other issue is simply understanding what an artist statement is and what it does… I’ll be going over all of that on my live call this coming Wednesday. I have worked as a curator during the 80tis and 90tis and agree with your statement about fear Ariane. I have had to do a lot of talking and convincing to get artists to write something about their work. Most of the time, it is the problem of the artist having difficulties, in expressing and explaining conceptually, not technically, what they do. What comes out is some kind of “Art Speak” that just makes no sense or has nothing to do with their artwork.